A large forest tree to 70 feet and a trunk to 2 feet in diameter, with spreading branches and an oval crown. A common bottomland tree across the eastern third of Texas, as far west as the Guadalupe River. Prefers moist, fertile soils. Opposite, compound, 10" to 12" long, with 7 to 9 leaflets arranged pinnately; leaflets are 2" to 6" long and 1" to 2" wide, short-stalked, ovate to lanceolate, pointed at the tip, margin smooth or faintly toothed. 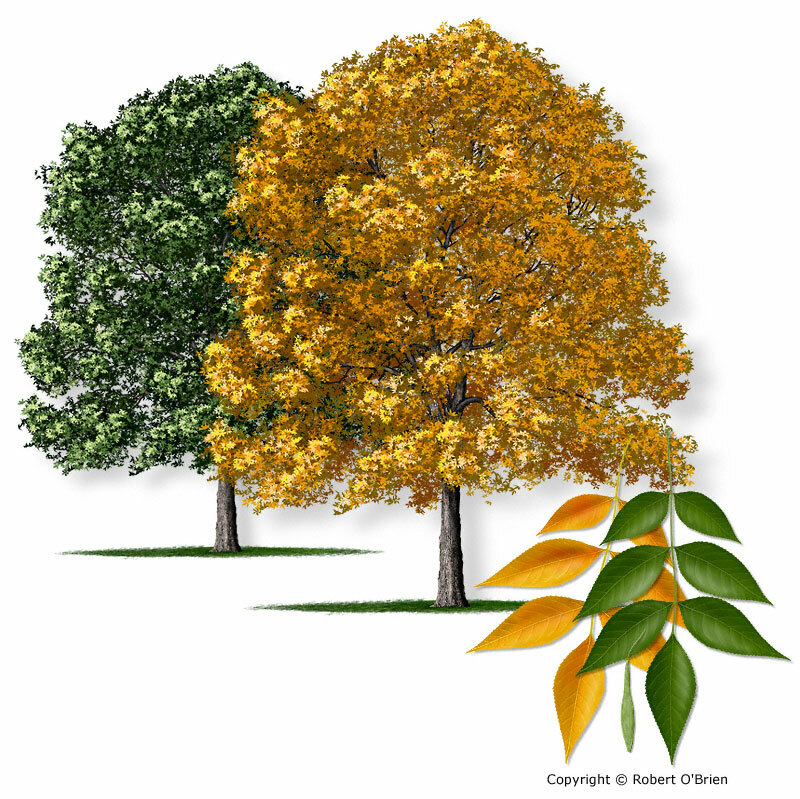 Leaf color is dark green above and light green beneath, turning yellow in the fall. Buds sit on top of the half-moon-shaped leaf scars left on the twigs after leaf drop. Male and female flowers borne on separate trees. Female flowers in loose clusters; male flowers appear as dark clusters of stamens near the end of the twigs, before the leaves. A flat, winged "samara," 1" to 1.5" long and 0.25" to 0.33" wide, the winged portion extending well down past the middle of the seed, maturing in late summer and distributed by the wind. Light brown to gray, thick, with flat-topped narrow ridges forming an interlaced pattern, the furrows dark. The wood is heavy, hard, rather strong, brittle, and coarse-grained. It is used for the same purposes as white ash but is not as desirable. Poison-sumac (Toxicodendron vernix) has alternate leaves and white fruits; Carolina ash (Fraxinus caroliniana) has fruits 1" to 3" long and 0.75" wide; white ash (F. americana) has whitish leaf undersides, and buds that sit down in the leaf scars. The most widespread ash species in North America.